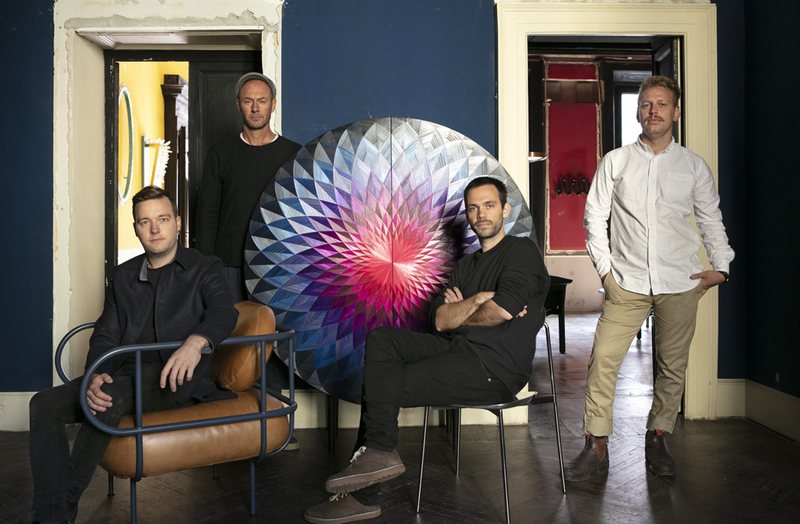 The Bloom cabinet was among the bold designs at the 2018 Milan Design Week and marks a new collaboration between famed Australian industrial designer Adam Goodrum and French marquetry artisan Arthur Seigneur, writes Susan Muldowney. This year’s Local Milan No 3 exhibition presented by Local Design at Milan Design Week was housed in a venerable palazzo with a weathered interior that seemed to enhance the bold new designs on show. 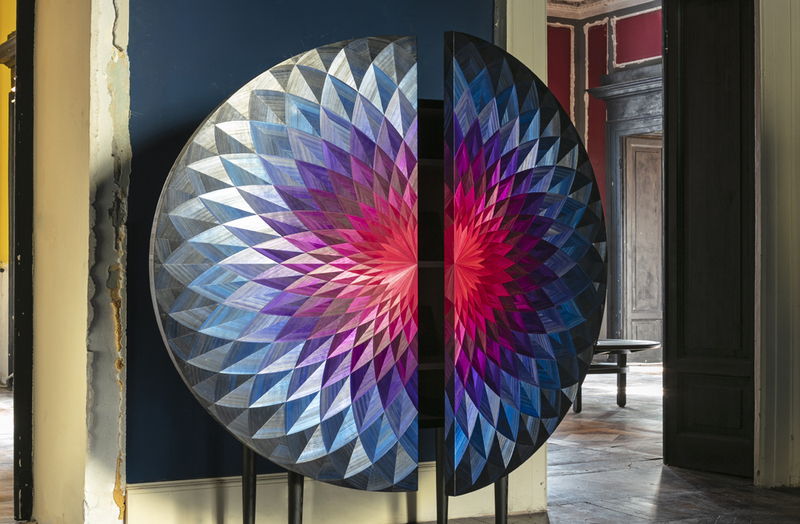 The piece that immediately caught the eye – partly due to its location in the front room of the palazzo and partly due to its kaleidoscopic façade – was the Bloom cabinet by Australian industrial designer Adam Goodrum and Sydney-based French marquetry artisan Arthur Seigneur. The Bloom cabinet is inspired by the form of a lotus flower and heralds a new era in collectable Antipodean design. It marks the second collaboration between Goodrum and Seigneur and the first purpose-designed piece in their newly formed venture, Adam&Arthur. Handcrafted in Sydney, its doors are composed of more than 1400 sections of premium-grade rye straw imported from speciality growers in Burgundy. A warm spectrum of colours comprises custom designed hues spanning cobalt, fuchsia and pale rose. Each stem of ribbon-thin straw was infused in vats of pigment for 24 hours and manually split, flattened into strips and delicately inlaid to timber panels by Seigneur’s deft hands. One of Australia’s most recognised industrial designers, Goodrum has worked with Australian brands such as Tait and Dessein as well as international clients like Alessi, Cappellini and Norman Copenhagen. He says the formation of Adam&Arthur represents an opportunity to create more artistic, one-off designs. “Unlike Europe and the US, Australia isn’t really known for one-off, collectible designs, but this is something we’re interested in creating,” explains Goodrum. Seigneur moved to Sydney from Paris in 2015. A graduate of the prestigious École d’ameublement de Paris La Bonne Graine furniture making school, he developed his straw marquetry skills working alongside Lison de Caunes, the French marquetry artist widely credited with reviving the centuries-old technique that characterises prized collector pieces of the art deco era. The chassis of the Bloom cabinet is handcrafted from black-stained oak and its luxurious, vibrant doors glisten thanks to the straw’s natural varnish. Each lotus leaf panel is inlaid in a contrasting direction to enhance the cabinet’s textural form. The Bloom cabinet was among the covetable Australian designs in Milan this year and Seigneur has a clear ambition for the striking one-off piece. “I hope that someone buys it,” he says. You can read an interview with the curator and director of Local Milan, Emma Elizabeth here.